My husband, the Boy and I took a turn around Brewer’s Brook today. Really, it was the Boy who decided that we should go as he was absolutely exhausted and refused to nap. However, after about 20 minutes of swaying with Dad’s gait in the baby backpack, he was drooling quietly on my husband’s shoulder, eyes shut. In any case, it was a beautiful day for a walk, with typical New England weather: changing every five minutes. We were crossing across the southern dam when I spotted the enemy, clustered together in a patch of sun. 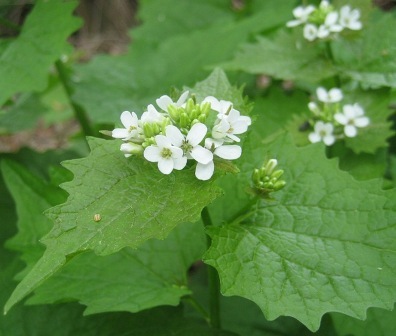 Garlic mustard was brought to North America as a culinary herb from Europe in the 1860’s. Now, however, it is classified as a noxious weed in many areas in the US, and out-competes native plants. But sadly for it, and fortunately for us, it’s also quite tasty. So, soon after May Day, I consider it my civic duty to pull it up wherever I find it, and turn it into pesto. Throw everything but the olive oil in the blender. While blender is on pulse, slowly add olive oil. Keep mashing everything down until it reaches a uniform consistency. Serve over rice or pasta. You’ll notice right off how much greener this pesto is than that made of basil (which oxidizes very quickly). It’s also much spicier since garlic mustard comes with a kick. Be sure not to compost any flowers from the plant, as the seeds verge on virulent and can be viable even after the plant is dead. This one heads straight to the garbage, folks. This sounds like an absolutely delicious pesto recipe. I’m about to whip up some nettle pesto tomorrow, and was just thinking that I needed a good use for all the garlic mustard I plan to pull up this season. Thanks! Oooh, nettle pesto! I’ve been keeping an eye out for nettles in my area, but I don’t think we have them—sad for my tastebuds, but probably good for the local kids!